Fog City Journal / Arts/Entertainment / The CrackBerry Chronicles Norouzetan Mobarak! Dr. Elahe Ensani, and Elaine Santore. If you’re Catholic, right now you’re in the throes of Lent and sacrificing and fasting your way to Easter. Or, if you’re my breed of Catholic, you’re trying to remember to eat fish on Friday. And you’re really hoping that your local church doesn’t go up in flames Easter Sunday. By contrast, Iranians are partying it up during March. As spring approaches, the Iranian community gets ready for the Persian New Year, Norouz. Norouz is celebrated in countries all over the world including Afghanistan, Turkey, Central Asia, and Albania. Norouz, which means “new day,” occurs around March 21. New Years Eve, the official time of the Spring Equinox, is called Sale Tahvil and takes place at a different point in time each year, but usually happens around March 20. In San Francisco, Sale Tahvil will take place Wednesday, March 19 at exactly 10:48:19 pm. Set your clocks! New Year celebrations last 13 days and include egg painting, spring cleaning and shopping for new clothes. The two themes of Norouz – ending and rebirth – coincide with the beginning of spring. Norouz also represents feelings of hope, peace and prosperity around the world. 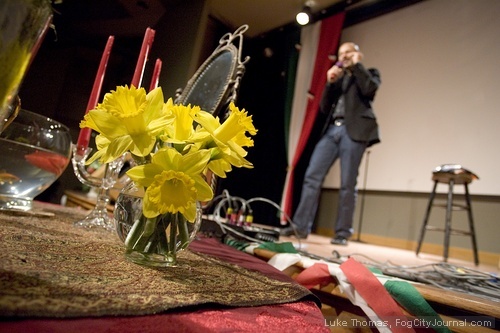 The San Francisco State University Iranian Culture Club kicked off their third annual Norouz Celebration Friday evening. 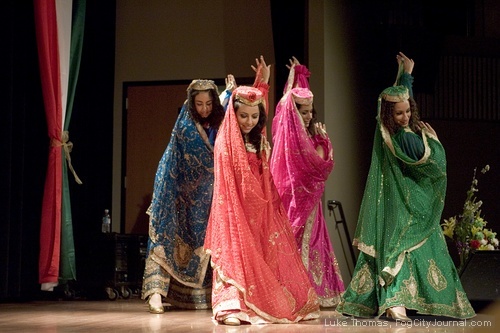 The ICC is a non-religious, non-political student organization dedicated to promoting Iranian culture at SFSU and in the Bay Area. 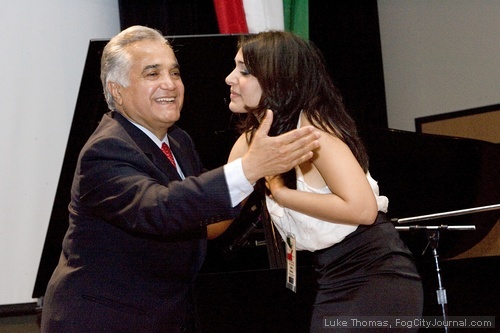 ICC President Shiela Rahimian and Vice President Sepeedeh Cigarchi. 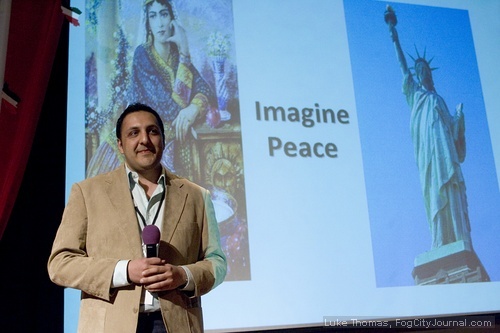 For two years, the ICC petitioned to start a Persian language studies program at SFSU, and their efforts paid off. Persian 101 has a total of 30 students and, according to Persian Studies lecturer Dr. Mitra Ara, the goal is to expand the program to history and cultural studies. Persian Studies lecturer Dr. Mitra Ara (far right). Ara is quick to make the distinction between Farsi and the Persian language. 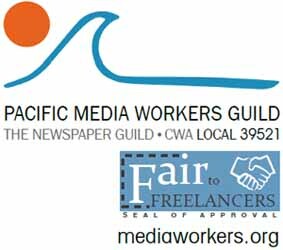 Proceeds from the sold-out event will be donated to charitable causes. Dr. Elahe Ensani, an engineering professor at SFSU, praised the ICC members’ commitment to philanthropy. “At this young age, they’re already giving,” Ensani said. She also praised the students’ leadership. 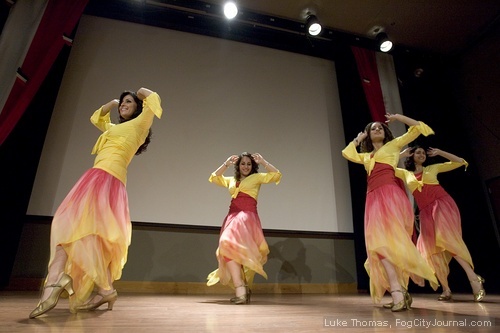 This year’s Norouz celebration mixed traditional and modern Persian music, song, poetry and dance. The program began with a rendition of the Iranian anthem “Ey-Iran” sang by ICC members. 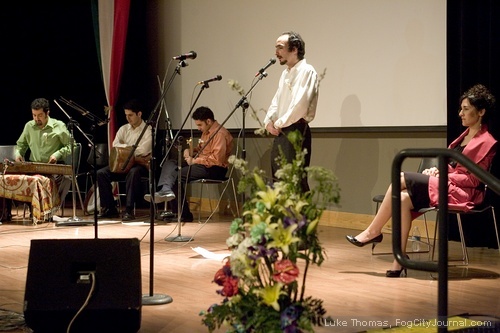 A group of musicians and singers performed traditional Persian music, weaving in improvisations and poetry by Hafez. 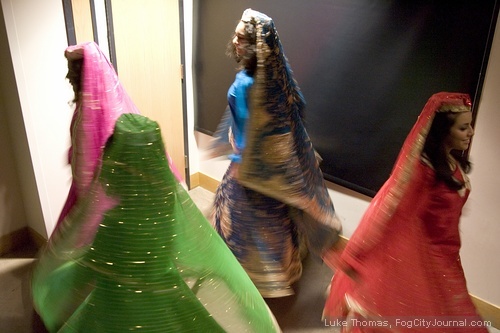 The Niosha Dance Academy performed two pieces, one traditional and a second routine that mixed traditional dance with modern music and modern costumes. 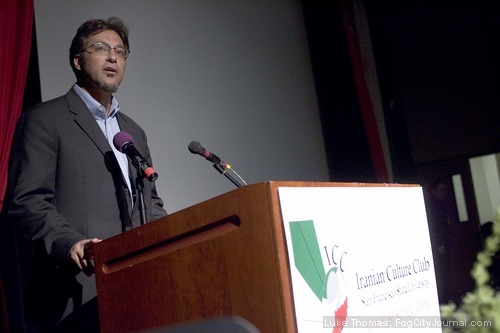 Supervisor Ross Mirkarimi, the first Iranian-American elected official in San Francisco, praised the work of the ICC. 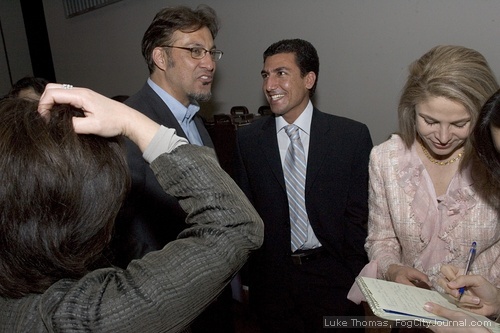 “I have complete pride in what’s being done at SFSU,” Mirkarimi said. 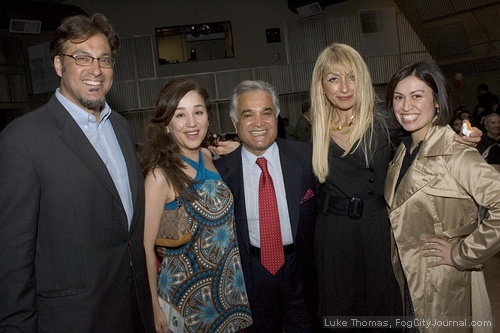 In reference to the negative portrayal of Iran in the media, and the threat of a war between Iran and Iraq, Mirkarimi expressed hope for the future. “At this time next year there should be change in the White House,” Mirkarimi said to loud applause. THEY the leaders believe in war and hate. 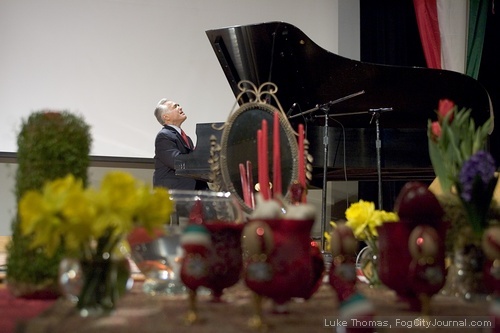 After his presentation, Ebrahimi addressed the audience and asked famed Iranian pianist and composer Anoushirvan Rohani to perform on stage. Rohani was not on listed on the program, but happily obliged. The audience immediately leapt to their feet. Anoushirvan Rohani and Shiela Rahimian. Iranian American actor and comedian Maz Jobrani performed a raucous stand-up routine that entertained Persians and non-Persians alike. Jobrani is currently performing in the Axis of Evil Comedy Tour. He’s originally from Tiburon. On the topic of Iranian President Mahmoud Ahmadinejad, Jobrani talked about Ahmadinejad’s statement denying the existence of the Holocaust. “Doesn’t he have a friend he can run that by before he tells it to the rest of the world, and embarrasses every Iranian in the world?” Jobrani asked. Joking aside, the comic emphasized the importance of cultural pride and embracing diversity in America. Fog City editor Luke Thomas topped off the culturally rich evening asking Jobrani why there were no Rashdi jokes in his repertoire. Thomas knows a few of those jokes from living in Vestvood, L.A.
More photos from the ICC/SFSU event available at Smugmug. Comments for The CrackBerry Chronicles Norouzetan Mobarak! are now closed. Well “Parsi” would be the Persian word for Persian and of course “Persian” is the English word for the language. I’m curious what that distinction might be. Is “Farsi” the Arabic word for Persian? And if so, what is the Persian word for “Persian”? Great photos, Luke, even by your usual standards. Saying ” I speak Farsi” is like saying “I speak Español,” or “I speak Français.” Persian is the English word that is used to refer to the Persian language. Farsi is the Persian word that refers to the Persian language. Very informative. Most Americans don’t know the difference between Persian culture and language and Arab culture and language. Everyone I’ve ever met has counted Iran as an Arab country when in fact it’s a Persian country.